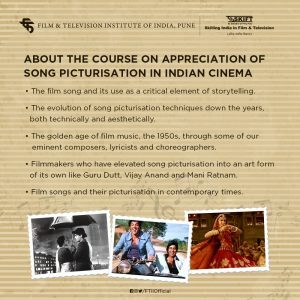 Mumbai:6/10/18:With 94 participants from 11 states in attendance, a unique 2-day Course on ‘Appreciation of Song Picturisation in Indian Cinema’ began at Film and Television Institute of India (FTII) today. 1) Maharashtra :: Mumbai, Pune, Kolhapur, Nasik, Nagpur, Solapur, and Parbhani. 5) Jharkhand-:: Chakradharpur, West Singhbhum district. Their educational qualifications include SSC, HSC, BBA, M Com, B.E, MBA, MA, BA, B.Com, Ph.D, BTech, Commercial Arts, B.E (Electrical), B.Tech (IT), B.Des, M Sc, MCS, BECS, M.Phil, BSC (Maths), B.E (Civil), PGDMM, MTA, M.Tech, B.Arch, PGD in Journalism & Mass Communication, MA (Eng), D.Ed, M Sc (Zoology), MPM, PG Diploma in Indian film studies. 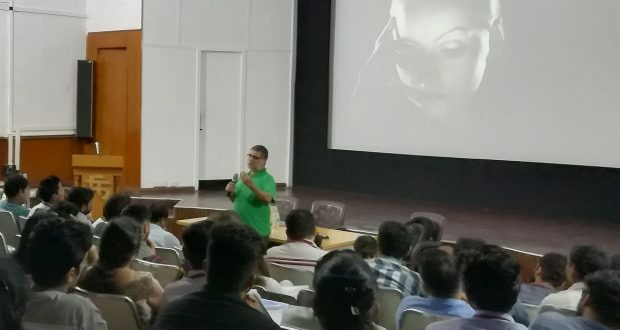 The Course was inaugurated by Varun Bhardwaj, Registrar, FTII Pune in the presence of Karan Bali, Course Director. The Course will cover film song and its use as a critical element of storytelling. It will touch the evolution of song picturisation techniques down the years, both technically and aesthetically, besides the golden age of film music, the 1950s, through some of our eminent composers, lyricists and choreographers. Works of filmmakers who have elevated song picturisation into an art form of its own—- Guru Dutt, Vijay Anand and Mani Ratnam— will be discussed as will be film songs and their picturisation in contemporary times. Karan Bali (FTII,Film Direction,1993) is a leading exponent of film music history. As a filmmaker, Bali has made several documentaries and also teaches filmmaking all over India.He has contributed considerably by writing on Indian cinema history in both, print and on-line media.